April 4, 2018, 12:14 p.m.
Facebook is adding an additional information button to news articles surfaced in the News Feed that will let users click through to see (1) background pulled from the Wikipedia page about the publisher, (2) other articles recently posted by the publisher, and (3) a heat map of where in the world the article is being shared and which of the user’s Facebook friends have shared it. Also recall that the Google-owned YouTube got itself into some trouble when its CEO Susan Wojcicki said at SXSW in March that it would add “information cues”/links to Wikipedia articles to certain videos, but Wikipedia said it wasn’t given a formal heads up about this plan. Wang, Shan. "Facebook is adding a button to let users get more “background information” (aka information from Wikipedia pages) on publishers." Nieman Journalism Lab. Nieman Foundation for Journalism at Harvard, 4 Apr. 2018. Web. 25 Apr. 2019. Wang, Shan. 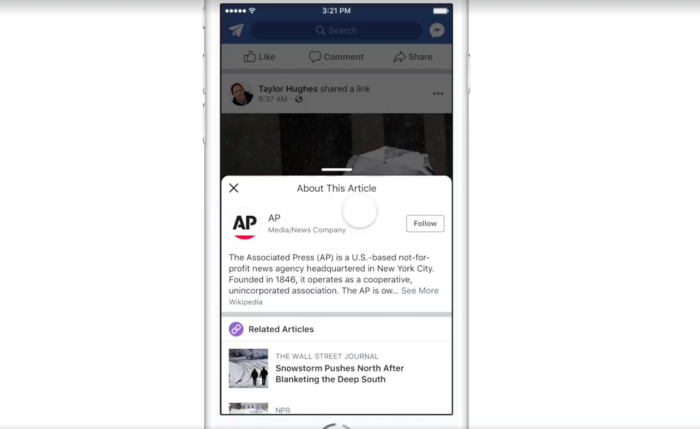 "Facebook is adding a button to let users get more “background information” (aka information from Wikipedia pages) on publishers." Nieman Journalism Lab. Last modified April 4, 2018. Accessed April 25, 2019. https://www.niemanlab.org/2018/04/facebook-is-adding-a-button-to-let-users-get-more-background-information-aka-information-from-wikipedia-pages-on-publishers/.